On Saturday, youth ambassadors from the Local Spokes initiative held a party in Sara D. Roosevelt Park to mark the end of their six-week summer program and launch a new signage installation on the Lower East Side. The event included bike tours of the neighborhood and came on the heels of the nine-group coalition’s action plan for better bicycling in the community. Youth ambassadors met with local organizations and government representatives during each week of the program to learn more about the planning process and sustainable transportation. The ambassadors also learned bike maintenance and safe cycling skills from partners including Recycle-A-Bicycle. 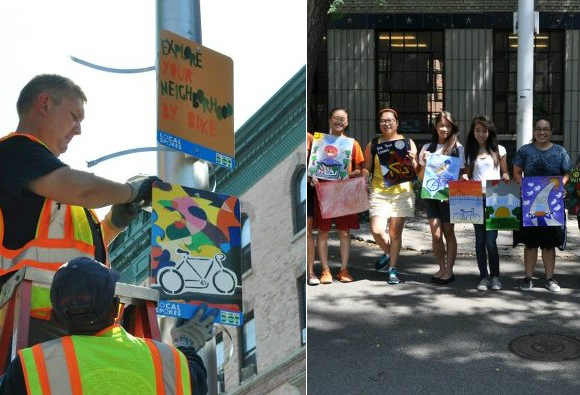 Saturday’s party also featured “Explore Your Neighborhood by Bike,” a signage installation designed by the youth ambassadors in partnership with DOT’s Urban Art Program. The signs have been installed throughout the neighborhood by DOT crews and Local Spokes is offering a guide listing the sign locations. More photos of the event are available from Local Spokes on Facebook.